Congratulations Al-Thuraya Bank Muscat Women’s Team! Rising Tide Leadership Institute Ambassadors Katie Pettibone and Dee Caffari finished up the EFG Sailing Arabia The Tour 2013 earlier this week. This is the second year that Katie and Dee (British skipper) joined the Oman Sail Women’s Sailing Team to coach the Omani women. 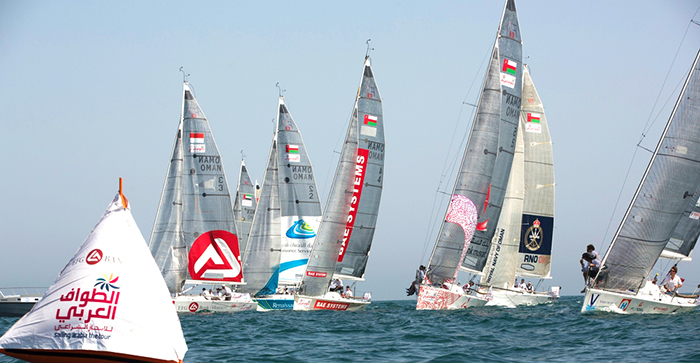 The Oman Sail program was launched in 2011 as part of an Omani national effort to celebrate the countries rich maritime history, and empower women in the world of sport. The sailing program puts a large emphasis on family support, encouraging parents to inspire their young daughters to pursue a sporting skill such as sailing, giving them the confidence to learn and compete in these exciting regional events. This year six Omani women aged between 21 and 28, with four on the boat at all times, comprised 50% of the Al-Thuraya Bank Muscat all-female crew. Two of these Omani women also competed in last year’s SATT race. 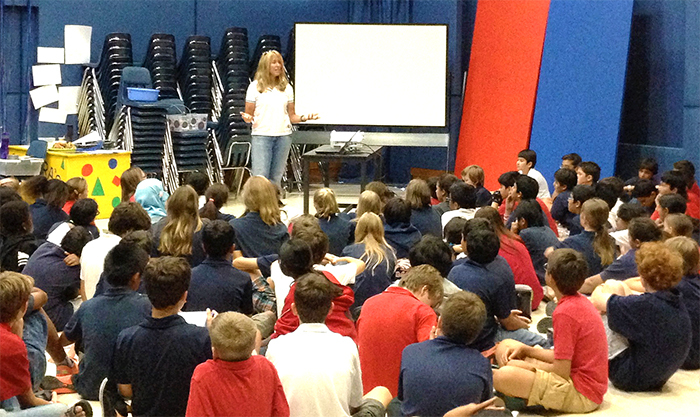 Yesterday, Katie had the opportunity to speak to middle school students at the American International School of Muscat (K-12). Katie was delighted to inspire these students, by reviewing how the Omani Women’s Sailing Team progressed in the past 2 weeks of intense sailing competition. Katie, a Michigan native, was on the first all-female America’s Cup crew in 1995, and competed in the event twice after that. She has many stories to share, having survived some harrowing sailing episodes, including a dismasting in the treacherous waters off Cape Horn, and a capsizing off Australia. The opportunity to encourage and inspire young people is not only rewarding, but imperative to Rising Tide Leadership Institute’s mission. Great job ~ Katie, Dee and the rest of the crew: Sarah Hornby (UK), Elizabeth Bayliss (USA) and the Omani Women’s Sailing Team ~ Basma Al Nofali, Raiya Al Habsi, Rajaa Al Uwaisi, Ibtisam Al Salmi, Tahira Al Yahyaee and Asrar Al Ajmi!